The Akshaya Patra Foundation was recently certified as a Great Place to Work by Great Place to Work® Institute. Apart from employees, our interns play a major role in making the place what it is. They share their experience with us. Q. Why did you choose this Organization? A. Firstly, I chose it because The Akshaya Patra Foundation is known for its Supply Chain Management” and I was looking to specialise in the same. Secondly, because of the organisation’s dedicated effort to eradicate hunger among children. Q. How’s your typical day like? A. It usually starts with a meeting with my mentor Mr Vinay Kumar C where we discuss my assignments for the day. He tracks my work every day. I got to improve my skills and knowledge at TAPF. My day doesn’t end without having lunch at TAPF which is delicious and hygienic. Q. What are the challenges you faced so far? How did you overcome them? A. One of the major challenges was to draft a research paper related to my work. This was my first time. My mentor helped me with it. Q. Any memorable moment you had at TAPF? What did you like most about interning here? A. I enjoyed attending Toastmasters club. While I did not get a table topic, I feel if I was given an opportunity, I would have understood where I stand. 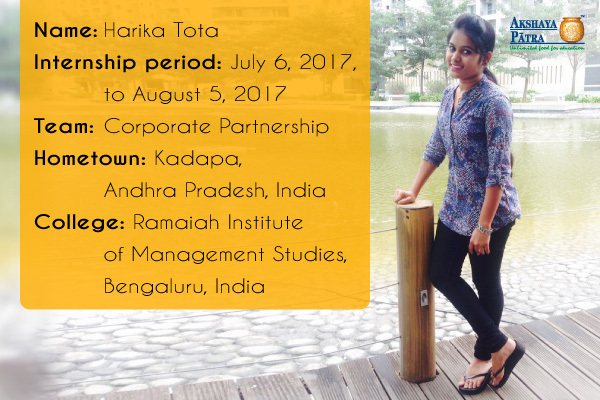 A. Akshaya Patra sets a good example of employer-employee relationship by providing opportunity to excel at work. The office has a lively environment. We get homely food. All this makes it a ‘Great Place to Work’. 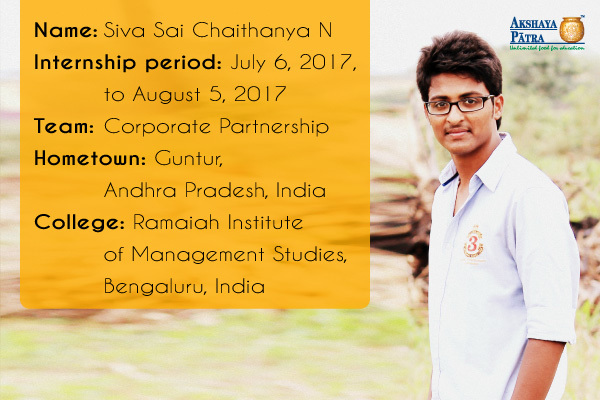 A. I am pursuing MBA and I was interested in learning about Operations Management. TAPF is a place where activities like processing of raw materials, quality assurance and maintenance, supply chain process has a key role in providing nutritious school meal for over 1.6 million children across 12 states. This made me curious to learn more about the organisation. A. It starts with briefing from my guide/mentor Mr Vinay Kumar C on regular work. With the help of tracker, he monitors our activities and our research work on daily basis. A. I found Toastmasters challenging. But then I realised that it will help me in my career. I am sure I will perform well next time. A. While I found Toastmasters difficult, I had fun attending it. It justifies the statement ‘Fun While You Learn’. I also like the work environment and the food here. A. Akshaya Patra is a ‘Great place to work’ because of its work environment, activities like Toastmasters club and the healthy relationship between employer and employee.